Motherhood is one of the many hats I’ve worn since the hubby and I first decided to have a go at this parenting business. My first professional position as a librarian was working at the world famous Thomas J. Watson library in the Metropolitan Museum of Art—one of the finest institutions I’ve had the pleasure of working for. Currently I work full-time as a librarian in acquisitions at Columbia University. In between, I’ve worked at public libraries, special libraries, and archives. Somewhere between the academic tenures of school and professional responsibilities of work, I also discovered, embraced and immersed myself in the world of extreme metal—a land few women, and especially mothers, had explored. The hat-wearing really began in early 2010, when I decided on two major things: to go back to school for a second master’s degree and to get married. The headbanging began years before that, as life changes drew me to explore new sounds and modes of expression in order to cope with dramatic alterations in the world around me. The decision to get married was a natural extension of being in a serious relationship for ten years. Going back to school was influenced by talks with several colleagues in which I was told it was usually how one became a subject librarian in higher education. Additionally, many of the art librarians I met also had a second master’s degree in the arts, so at the time, it seemed like a very reasonable and worthwhile endeavor, and one I could blend with my newfound passion and interest, bringing an academic slant to a subculture that was lacking in disciplined study. So right after my marriage, I enrolled in well-known anthropology graduate program that offered evening classes and catered to older adults in NYC. At the onset, I liked that my classes were affordable and reasonably paired with a full-time work schedule. It also allowed me to schedule time to attend events that catered to my musical interests and to explore them from a newly-conceived anthropological slant. My first year went by swimmingly, but of course this was before my impending motherhood. Several events in 2011 coalesced into challenges for work, study, and home life. For one, although my time at the Met was well-spent, I started to notice a trend with regard to librarians— especially those who were also parents—and that was that there were very few (at least at my institution). This lack of librarian-parents came down to a few reasons. One reason, which is a national issue at most workplaces, is the maternity leave policy. While some parents-to-be had careers in which their employers facilitated the best prospects for a work/life balance, the Met was still catching up. Additionally, salary really didn’t help my prospects towards future plans of growing a family and living in New York. As most folks in the non-profit art world know, it’s not always the most lucrative job being an artist, and it’s the same for art librarians. So I did what I thought was best for my marriage, career, and academic aspirations. I sought out employment that would offer me the best of both worlds: academic engagement and work/life balance. I distinctly remember interviewing while I was 3 months pregnant, both glad and sad to not be showing yet. I was nervous but determined to make the best of either potential outcome—getting a new position or making the best of staying at my current job. It probably didn’t help that more and more women I encountered on and off the job were having families or thinking about them. Adding to that, I saw more women leaving the library world to do so. Yet being around all of this offered me some clarity. I decided not to feel guilty about having a family, and I think that’s the attitude that carried me through getting a new job and being very up-front about the pregnancy and commitment to doing great work. In a very real way, that’s the dynamism of a rock-and-roll attitude. However, being pregnant and starting a new job was just the tip of the iceberg. I was also considered a “high risk” pregnancy, as I am a type II diabetic. So added to my already-packed schedule were additional visits with my OB, perinatologist, and endocrinologist. This, naturally, led to a drastic reduction in show and festival attendance as well. Saying that my time spent interviewing, getting a degree, and working full-time was hectic would be a grave understatement. As luck would have it, I was accepted and started my new job in 2012 with better work incentives and benefits. Looking back, it seemed to be timed perfectly. I started making a well-deserved salary, more in-line with my credentials and furthering education, and was able to take three months maternity leave and up to a year off with a flexible work schedule. This was something I couldn’t even dream of in my last job. To be able to spend time with my newborn was a pleasure I did not take for granted. It’s probably why I still don’t understand why the United States is so behind with regard to their maternity/paternity leave policies. In many ways, it allowed me to work more efficiently as a mother, academic, and librarian … at least for that first year. The second hurdle I encountered was coming back to work and school. 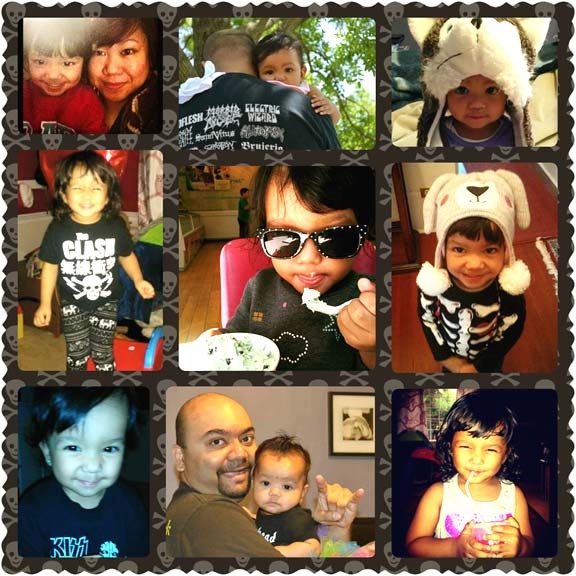 I had taken a year off from my graduate program in order to attend to full-time work and my new family life as a mom. When I returned to school in 2014, I felt different, to say the least. My goal of attaining this second master’s degree hadn’t changed, but the speed in which I was able to proceed did, as did my perception of the already-high amount of effort required to succeed. My evening classes seemed to be longer, even though it was 2-3 evenings a week, and my sleep really did get away from me. On some nights, it was very difficult for me to come home as late as 10pm and feel like I had wasted the day and didn’t spend any time with my daughter. Did I mention that I’m not quite finished? I’m currently writing my thesis, which of course means my weekends are spent feeling guilty that I’m either 1) catching up on sleep, 2) spending time with my daughter and husband, 3) writing and researching, or 4) working on all of the things you can’t get done during the work week, i.e. – grocery shopping, laundry, gardening/lawn care, car maintenance, cleaning the house, CLEANING the house! Finally, the practical aspect of doing thesis research was another obstacle for me. Though I chose not to do fieldwork outside of the local NYC area, I did have to go about visiting sites and interviewing people from around the tri-state region. My research, which is on women in NY’s extreme metal music scene, included going to shows/concerts, bars, and festivals—not the safest of places for a pregnant woman. And yes, I was 6 months pregnant when I went to the Maryland Deathfest to observe the women in attendance, taking note of their behavior, appearance, demographics and ethnicities. One of the more interesting highlights of my research was encountering women in the scene who are also mothers. It seems this troublesome business of parenting in academia was no different than the challenges metal mothers were facing as musicians on tour. Parenting involves a lot of hours of guilt—guilt that I should be home; guilt that I should be at work; guilt that I missed the first steps, first words, etc. I found there was no difference with what hat I was wearing; whether I was being a metalhead academic, working in the library, or being a student, life didn’t wait around. So what sage advice can I give? Is there any hope? How does one get through it? Is there light at the end of the tunnel? Yes, but it’s a difficult journey—especially in the early stages when your children need you to care for them more readily and your husband still hasn’t learned to find his socks. This is only made more so when you lack support from the village that you need to raise a kid. For me, I have the support of my husband, family, and work environment. As much as I joke about them, they do their best to help me carry through. I can’t say I know many women who are librarians and/or graduate students that have that kind of help and understanding. I do know that certain higher education institutions have made it a point to offer great incentives for retaining and hiring top-notch faculty, including consideration of their familial commitments. This is a great motivator for moms who are trying to balance the many different aspects of their lives without dropping a hat into the river of life. Finally, remember that you and your family come first. I think we tend to forget that as we transition both our careers and personal lives. What one decides may not be right for another, so take time to think through the options that work best for you. This entry was posted in Parenthood and Ethnomusicology and tagged anthropology, ethnomusicology, parenthood, Students by semstudentunion. Bookmark the permalink.